When I originally asked the 4 year old what he thought we should make for the letter I to go in our alphabet book, I got some pretty interesting responses. In fact, we had quite the lengthy discussion on whether or not lizards started with the letter I. In the end, we decided to compromise with an iguana since it is somewhat lizard-like and yet, still starts with the letter I. Now, you may be wondering what that black mark is up there on our iguana’s face and I promise, we’ll get to that! First up, cut your lowercase letter I out of your green construction paper and set it aside. Don’t forget the dot at the top! Next, you’ll need to start cutting out the rest of your pieces. You’re going to need a few triangles, however many you would like on your iguana, cut from that same construction paper. Cut a few larger ones for the spikes down his back and a few smaller triangles for his head. Finally, cut out a shape for the tail and two legs. I mean, he’ll obviously need something to stand on. Start by gluing your lowercase letter I right onto your card stock. Follow that up by adding the legs and the tail. Your child can obviously have them pointing whichever direction they would like just make sure that you have the legs on one side and the tail on the other. Now, start adding the spikes. Use however many you like and place the larger triangles on the back of your letter and glue the smaller ones around the back of the head. 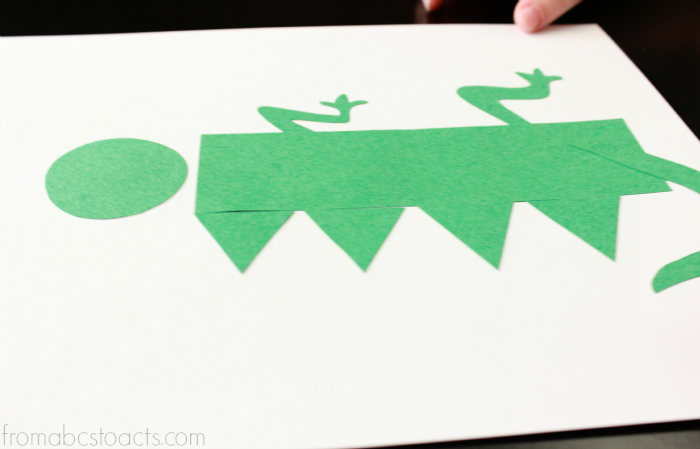 If you’re really getting into the whole lizard thing, grab a green Do-A-Dot marker to complete the lowercase letter I page and you’re all set!